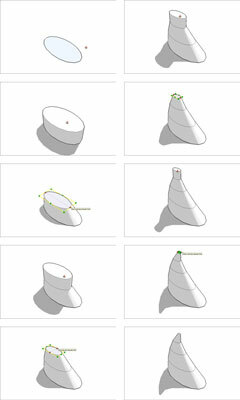 Making organic forms in Google SketchUp involves using the Scale tool in combination with a series of 2D profiles to create curvy, lumpy, distinctly un-boxy 3D shapes. An awful lot of the stuff in the universe fits squarely in this category — just about everything that wasn’t made by a machine can be modeled using the scaled profiles method of 3D modeling. Push/pull your 2D shape into a 3D form. Scale the new face you created so it’s slightly bigger (or slightly smaller) than the original 2D shape from Step 1. Push/pull the face you scaled in the preceding step. Try to make this extrusion about the same as the one you made in Step 2. You can usually double-click a face with the Push/Pull tool to repeat the last Push/Pull operation you did. Repeat Steps 3 and 4 until you’re done. You can add skillful use of the Rotate tool into the mix if you like; doing so allows you to curve and bend your form as you shape it. Watch your polygon count. Polygons are faces, basically — the more you have, the “heavier” your model becomes, and the worse it performs on your computer. Try to minimize the number of faces you’re working with by reducing the number of edges in your original 2D shape. Don’t be afraid to go back and tweak. The beauty of this method is its flexibility. While you’re working, you can select any of the 2D profiles (shapes) in your model and use the Scale tool to tweak them. Just select the loop of edges along the perimeter of the profile you want to scale and take it from there.